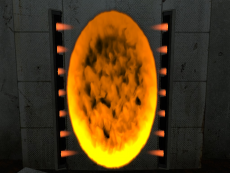 Active portal spawner with an orange portal as it appears in Portal 2. The portal will open and emergency testing will begin in three, two, one. Portal Spawners, also known as Portal Emitters, Portal Doors, or Autoportals are test mechanics that appear in Portal and Portal 2's single-player campaign. When activated, a Portal Spawner will spawn a portal inside of it. Each spawner is set to spawn a particular color portal. Spawners are sometimes activated as soon as you enter the test chamber. Other times, they are activated by Pedestal Buttons or set on a timer. In the very beginning of each game, when the player has no Handheld Portal Device, both blue and orange Portal Spawners can be found in the test chambers. Once the player has the Single Portal Device and can fire blue portals on their own, only orange Portal Spawners appear. When they have the Dual Portal Device, Portal Spawners disappear altogether. 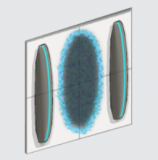 An icon of a Portal Spawner can be found in the Puzzle Creator's files, despite it not being in the Puzzle Creator. Active spawner with an orange portal, as it appears in Portal. Pre-release Portal screenshot showing an inactive spawner. Unused icon of the spawner in the Puzzle Creator's item palette, also using Portal's spawner frames. This page was last modified on 10 January 2018, at 01:06.